Washington Redskins quarterback Kirk Cousins threw four touchdown passes, two to Jordan Reed, and 324 yards and the offense bullied their way for more than 200 yards rushing on their way to a 47-14 beat down of the New Orleans Saints. CB Dashon Goldson returned an interception 35 yards for a touchdown and kicker Dustin Hopkins made four field goals to round out the scoring. Saints quarterback Drew Brees threw two touchdowns, but also two picks. The Saints also failed on three fourth down conversion attempts, including one deep in their own territory. The Redskins improved to 4-5 and will face the Panthers next week in Carolina. After a scrambling opening kickoff and a penalty, the Redskins started their opening drive inside the 5 yard line. However, a long pass from Kirk Cousins to DeSean Jackson of 42 yards was the key play to give them some breathing room. A few plays later, Cousins found TE Jordan Reed, who sped toward the end zone, stretching out for the final yards to give the Redskins an early 7-0 lead. The Saints would not be deterred, sparked by a 70 yard run by Mark Ingram, after what appeared to be a blown tackle by the Redskins defense. A few more plays and Brees threw a short 4 yard touchdown pass to Brandin Cooks to tie the game at 7-7. The next Redskins drive featured a couple big plays from RB Matt Jones. First, he ripped off a 20 yard run to get the offense in Saints territory before catching a screen pass and getting into the red zone. Cousins then found Jamison Crowder for the rookie’s first NFL touchdown and extended the lead to 14-7, still in the first quarter. The Saints were ready to respond, but the Redskins defense had a different idea. The D held the Saints offense to a three and out and the first punt of the game to open up the second quarter. However, the Saints D also woke up, and after a couple incomplete passes by Cousins and the Redskins needed to punt the ball away. The big plays continued as Brees dodges a strong run and found Cooks for their second touchdown hook up of the day, this one for 60 yards. With just under 11 minutes to go in the half, the game was all knotted up at 14 each. Anything you can do, the Redskins offense said they can do better. Cousins found Jones again for another screen pass, and the rookie picked his way through the defense for 78 yards and another touchdown for Washington. The Saints offense couldn't get going, with Brees getting sacked for a big loss. They went three and out again before punting the ball away. Cousins and the offense appeared to be moving, going 66 yards before stalling out Dustin Hopkins booted a 35-yard field goal to extend the Redskins lead, 24-14, with just a little more than 3 minutes to go in the half. The Saints tried once again to get their offense restarted, but three quick plays and the Redskins got the ball back with less than two minutes to go in the half. Using the hurry-up offense, Cousins was able to complete a quick pass to Crowder before taking a sack on the second play. Another pass play was incomplete, but a penaty by the Saints defense kept the drive alive. Cousins then found Chris Thompson for 23 yards before Cousins took another sack. However, a wide receiver screen to Crowder and great blocking downfield put the team back in scoring range. Using the short pass, the Saints took the second half kickoff and drove down to just short of the Redskins 30 yards. After getting stuffed on a third down run, they tried going for it on fourth down -- only to get stuffed again, and getting no points after a 10 play, six minute drive. RB Alfred Morris, who was injured earlier in the game, definitely was fresh, running for 28 yards on the opening play of the drive to get the Redskins in Saints territory. However, a couple short runs and incomplete passes opened the door for a 40 yard field goal attempt by Hopkins. He drilled it for his third of the day, and the Redskins led 30-14 in the third quarter. Brees attempted a long pass that was nearly intercepted, a penalty pushed them back, and another Brees pass was nearly picked off again. Three and out and the Saints were forced to punt for the fourth time in the game. A short field after a short punt and the Redskins had good field position. They made good use of it, driving down into a position where Cousins could find Reed on an inside route for their second touchdown of the day. The Redskins have scored the last 23 points. The Redskins defense decided to get into the scoring. A Brees pass was picked off by Dashon Goldson and returned 35 yards for a touchdown. Up to this point, the Saints offense has only managed 252 yards. The defense came up large again, stuffing the Saints offense deep in Saints territory. After what appeared would be another three and out, Brees waved off the Saints punt team and tried to go for it on fourth down, but threw an incomplete pass. The Redskins took over on down on the Saints 22 yard line. Rush after rush, the offense pushed closer to the end zone while wearing down a worn Saints defense. Another Hopkins field goal, his fourth, pushed the lead to 33 with just under 10 minutes to go in the game. The Saints offense appeared to get some movement against a defense that was preventing the big play. However, when Brees attempted to go deep, his pass was intercepted by LB Perry Riley, who made a fantastic play on the ball, stopping the Saints offense. Colt McCoy entered the game as quarterback for the Redskins. Cousins finished the game with a perfect passer rating of 158.3 (and if you can figure out the formula, you are probably a mathematician). The offense kept grinding the ball, eating up time, and the Redskins punted for only the second time in the game. 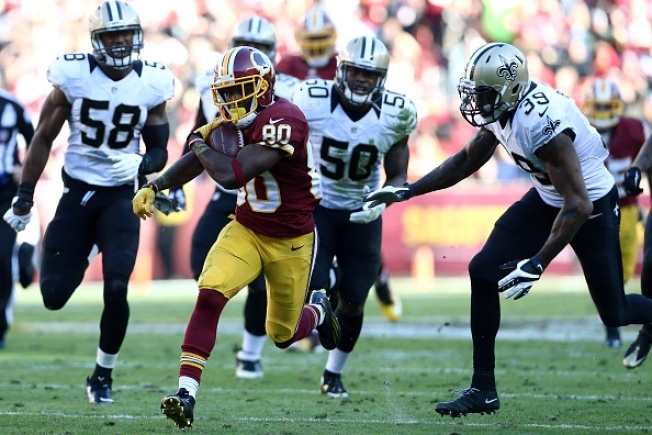 The Saints were content with just running the clock out as well and the Redskins finished with a 47-14 win.